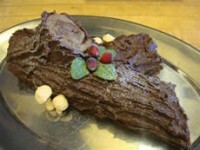 It is a tradition in France for Christmas to make (or buy) a chocolate cake deccorated to look like a log. The trick is to make all the decorations look like they would in the forest. This cake would make an attractive centerpiece for the table or a great gift. You can also give a basket of meringue mushrooms made with the extra meringue and chocolate buttercream. 1/2 lb. butter, at room temp. Preheat the oven to 375 degrees. Line a 12 x 17-inch Swiss jelly roll pan with buttered parchment. To make the cake in the bowl of an electric mixer beat the eggs with the sugar until thick and light colored. Sift in a mixture of potato flour, baking powder, cocoa, and a pinch salt. Fold together until blended, and spread evenly on the prepared pan. Bake in the preheated oven until the cake is firm to the touch and slightly pulled away from the sides of the pan, about 8 minutes. While the cake is still warm, and holding the parchment on the sides of the pan, turn the cake away from you onto a tea towel sprinkled with sugar. If the edges of the cake are tough, trim them. Brush the warm cake with the melted jam and using the towel roll the cake lengthwise into a round. To make the frosting, put the egg yolks into the bowl of a mixer and the sugar into a heavy pan with enough water to make a paste. Stir the sugar and water over a gentle heat with a wooden spoon until the sugar is melted. Turn up the heat and let boil until the sugar syrup reaches the small ball stage on a candy thermometer, or 225 degrees. Immediately, pour the sugar syrup on the eggs mixing at high speed. Continue mixing until the bowl is cool. Then, mix in the butter two tablespoons at a time with a few grains of salt. When the buttercream is smooth, transfer a generous half cup to a small bowl. Add enough coffee extract to give it coffee flavor. Stir the melted chocolate into the remaining buttercream; then, stir in the rum. To make meringue mushrooms, in the bowl of a mixer, beat the egg whites until quite stiff. One tablespoon at a time, beat in the sugar and stop beating when all the sugar has been incorporated. With a rubber spatula, spoon the meringue into a pastry bag fitted with a 1/4-inch plain tip. Gently squeeze rounds onto a baking sheet lined with parchment trying to make them spherical and then pipe out long pointed stems. Bake in a 250 oven for about 20 minutes. When cool, make a hole in the bottom of each rounds with a small pointed knife. Spread the bottom of the round with a little of the chocolate buttercream and fix with a stem.